Home > Subwoofer Boxes > Powered Subwoofer Boxes > Single 10"
Are you wanting to add a system to your car, but don't have any of the components and not sure about what goes with what? We've got the perfect solution for you! 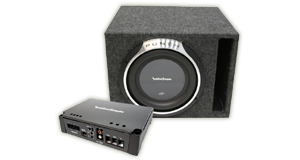 We have a large selection of powered single 10" subwoofer boxes that have been matched up and pre-wired so all you have to do is install or have the system installed. These "plug-n-play" packages have been tuned, tested, and certified to provide the correct level of power and performance!